John Hutson has been running a Ballroom & Latin American dance school at the Memorial Hall in South Woodford since before 1976, now 50 years. John was introduced to dancing originally when he was a very young man & attending Wanstead High School. Having started tuition there, he enjoyed it so much that he carried on with lessons after he left school. As a young man John had originally been working with a dance school in Wanstead, but the building was sold & demolished to make way for a new block of flats. He then switched to working in a hall attached to the St Phillip & St James Church in South Woodford, which was also subsequently demolished, when construction of the A406 took place. Using the Memorial Hall as a base for the dance school came about originally because, having previously attended one or two events there, he found it to be a rather pleasant place. 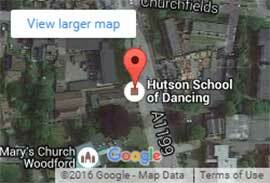 Enquiries were made & it transpired that there was suitable space vacant & so the dance school was moved there. Later on, John was offered the chance to take early retirement from his office job & this led to the opportunity to spend more time developing the dance school. 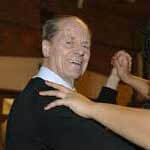 Even now in his ‘senior years’ & Johns passion and commitment for everything Ballroom & Latin is still very evident and he is still going strong, attending every lesson at the Memorial Hall in South Woodford, and he is still playing a key part in the John Hutson School of Dancing in Woodford, East London.